Winter is coming to the Oregon coast, bringing with it the annual rainy season. Geese migrate south, salmon return to the rivers, and coastal visitors become fewer and fewer. These visitors are the bread and butter of many coastal economies, and out-of-town visitors comprise the majority of people visiting the ocean shores adjacent to marine reserve sites. 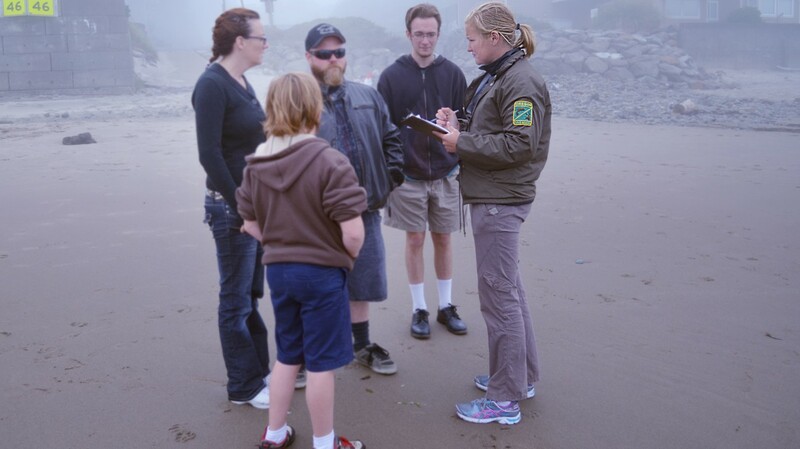 Over the past several years the ODFW Marine Reserves Program has been conducting visitor surveys to gain a better understanding of who visits these areas and why. These baseline data can be compared with future studies to see if any changes in the visitor population occurs in connection with the marine reserves. One goal of Oregon’s marine reserves is to avoid significant adverse impacts to ocean users and coastal communities. Because tourism is a mainstay of many coastal towns, understanding visitor behaviors will help shed light on if and what types of impacts marine reserve implementation has on local communities over time. These initial baseline studies provide the foundation to make comparisons in the future. Results from this baseline research illustrates some key information about visitor behavior and preferences. For example, just over half of the coastal visitors were actually from Oregon, while the rest tended to travel from adjoining states and as far as Europe and Asia. Visitors tended to have moderately high income levels, with roughly three-quarters making more than $50,000 per year. They also tended to have higher levels of education, with over half holding college degrees. The majority of visitors stayed overnight on the coast, averaging about six nights during their stay. The survey inquired about the reasons people visited the coast, along with what kinds of activities they did during their stay. Some of the top reasons they visited were: general beach use, sightseeing and/or wildlife viewing and visiting friends and/or family. Some of the main activities people did while visiting were: visiting the beach, sightseeing, visiting a state park, hiking and/or camping, along with tidepooling. The survey also gauged people’s awareness of Oregon’s marine reserves and showed that the majority of visitors were unaware that Oregon had marine reserves, even though these visitors were surveyed at marine reserve sites. With the last visitor survey wrapped-up this past summer, collection of this baseline data is now complete. This information gives us a better understanding of who is visiting at the marine reserves and why, and provides the baseline information to compare in future studies. 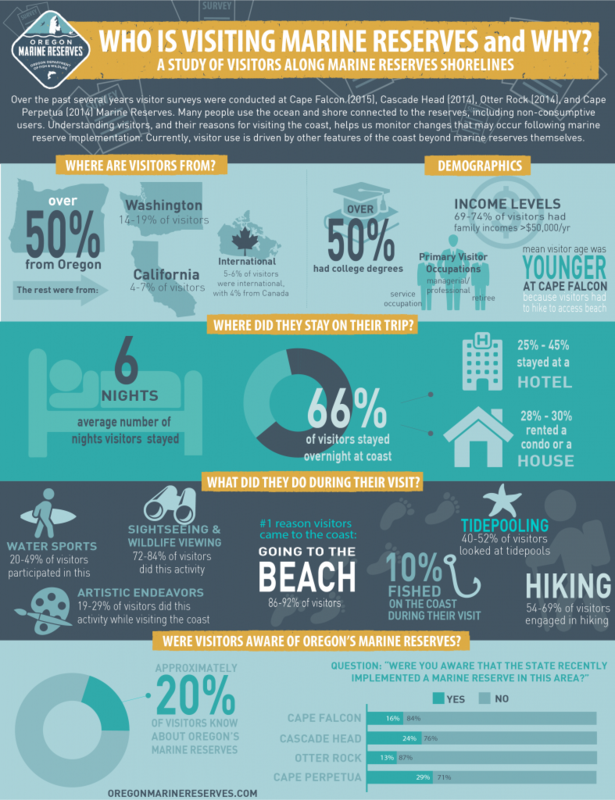 Read the 2014 Visitor Survey Report on Cape Perpetua, Otter Rock and Cascade Head Marine Reserves and the 2015 Visitor Survey Report on Cape Falcon Marine Reserve.